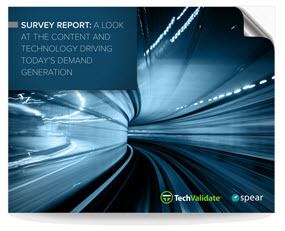 A recent survey by content automation company TechValidate and B2B agency Spear Marketing Group provides useful insight into the content, tactics, and technologies proving most valuable for today’s B2B marketers. More than 200 marketing VPs, directors and managers responded to the survey, which asked respondents to identify the crucial factors in driving demand generation ROI. • Technologies considered most crucial to marketing success were Content Marketing, SEO, and Marketing Automation. • Asked which technologies they projected would have most importance in the next 12-18 months, respondents also named Lead Lifecycle/Attribution Reporting and Predictive Analytics. • Video was named the content type that marketers project will be most essential in the coming year. • Top issues for B2B marketers are 1) lack of budget, and 2) lack of resources or know-how. One observation of note – technologies that are currently hot topics in the marketing press (and on this blog), particularly predictive analytics and programmatic advertising, barely enter the radar in this survey. This suggests, as the survey report itself concludes, that despite the press attention, adoption of newer technologies by B2B marketers is lagging. A free copy of the survey report – including a complete summary of results along with expert analysis – is available for download from the Spear Website. This entry was posted in B2B Marketing, Campaign Planning, Content marketing, Demand Generation, Marketing Automation, Uncategorized and tagged b2b demand generation, Content marketing, Demand Generation, marketing technology, predictive analytics, programmatic advertising, techvalidate on September 15, 2015 by Howard Sewell.